The screening process is often a new patient's first experience with the clinic. 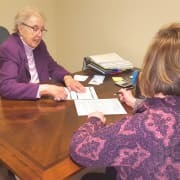 Volunteer screeners are responsible for reviewing the patient's financial information and ensuring they meet the eligibility requirements. New patients must undergo screening before they can receive services, and all patients must re-screen annually. Screening takes place every Tuesday and Thursday from 12:30 - 3:30 p.m. and every Wednesday from 8:30 - 12:00 and 1:00 - 4:00 p.m.
All necessary training is provided, and the required background check is at no cost to the volunteer. If you'd like to volunteer, please complete our online application. It can be easily reached by copying the link below and pasting it into your address bar. While a background in Finance is not required, it is helpful.